Fenerbahce Ulker will compete against archrival Aadolu Efes in Sunday’s Turkish Cup final. Fenerbahce became the first finalist when it defeated Pinar Karsiyaka 74-69 in the first of two semifinals on Friday in Gaziantep. Later Efes eliminated Darusafaka Dogus 73-88. Andrew Goudelock scored 15 and Emir Preldzic tallied 10 points and 10 assists to lead Fenerbahce. D.J. Strawberry scored twice in a 0-12 first-quarter run that gave Karsiyaka a 7-16 advantage. Goudelock drew Fenerbahce within 16-21 after 10 minutes and to 23-25 in the second quarter, but Karsiyaka rebounded to take its first double-digit lead at 26-36 on a Jon Diebler triple. Cemal Nalga made it 28-40 at halftime. Fener rallied in the third quarter as Nemanja Bjelica and Kenan Sipahi each hit a pair of threes before Goudelock scored 5 straight points to put his team ahead. Luka Zoric free throws capped a 13-1 run that made it 53-49 late in the quarter. Karsiyaka stayed close and tied the score five times in the fourth quarter alone, the last at 63-63 on a Kenny Gabrial basket with three minutes remaining. A Preldzic triple gave Fener a 5-point cushion. Karsiyaka drew within 3 three more times, but Zoric wrapped up the win with a basket with 10 seconds remaining. Nemanja Bjelica and Jan Vesely each added 10 points for the winners. Diebler scored 14, Gabriel 13 and Bobby Dixon amassed 11 points, 7 rebounds and 6 assists for Karsiyaka. Anadolu Efes eliminated Darusafaka Dogus 73-88 as Stratos Perperoglou shined with 15 points and 10 rebounds. Efes held slim leads throughout the first half, which ended at 45-48. Back-to-back threes by Perperoglou and Matt Janning gave Efes its first double-digit lead, 51-62. Birkan Batuk drilled a three to extend the difference to 15. 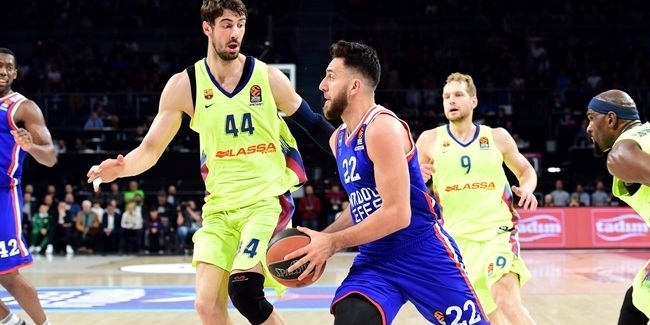 Jamon Lucas narrowed the gap to 57-68 through three quarters, but Efes remained in control and cruised to victory. Nenad Krstic added 14 points and Dario Saric scored 13 for the winners. Lucas led the Darusafaka attack with 14 points and Jordan Farmar and Gasper Vidmar scored 10 each. 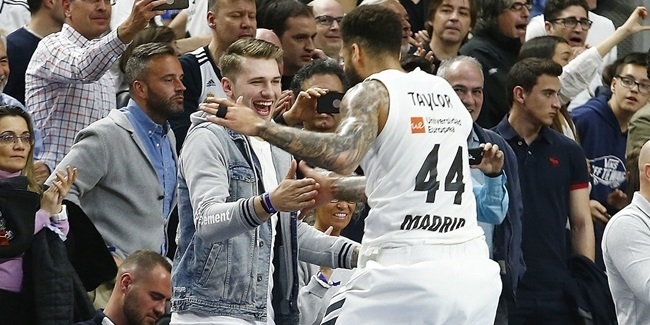 Real Madrid and FIATC Joventut joined Thursday’s winners FC Barcelona and Unicaja Malaga in the Copa del Rey semifinals with respective wins Friday in Gran Canaria. Madrid defeated CAI Zaragoza 85-73 as Rudy Fernandez starred with 16 points, 8 rebounds and 6 assists. 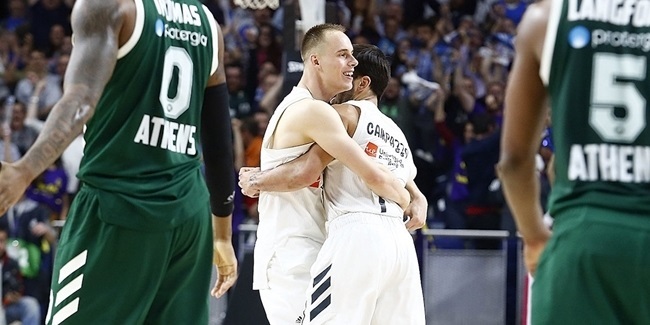 Jaycee Carroll added 13 points and Sergio Rodriguez and Sergio Llull scored 11 each. Henk Norel paced CAI with 14 points. It was tied at 21-21 after 10 minutes and CAI pulled ahead 37-41 at halftime. Madrid made its move with a 15-0 third-quarter run in which Gustova Ayon and Fernandez each scored 6 to give Los Blancos control at 54-46. Fernandez later gave Madrid its first double-digit cushion, 61-51, and Rodriguez’s triple made it 67-56 through three quarters. Rasko Katic scored the first 4 points of the fourth quarter, but that was as close as CAI got. Rodriguez answered from downtown, Carroll soon hit another two from downtown and Madrid never looked back. FIATC Joventut eliminated host Herbalife Gran Canaria Las Palmas 67-74 in the fourth and final quarterfinal game. Sergi Vidal scored 10 of his game-high 21 points in the fourth quarter to guide Joventut to the come-from-behind victory. Granca led by as many as 5 in the first quarter, but Joventut used a 0-9 second-quarter run to take a 28-34 edge at halftime. The hosts reeled off 9 unanswered points early in the second half to a 37-28 edge after a Kyle Kuric jumper. Kuric added a three as the lead swelled to 49-41 before Demond Mallet free throws left Badalona within 53-48 through three quarters. Back-to-back Vidal triples put Joventut up 53-56. Granca came back to within 60-61 on a Tomas Bellas three. Another three from Vidal and a Clevin Hannah jumper gave Joventut a 64-70 cushion with 1:34 remaining. Vidal added another score on a tough drive with a minute remaining to pave Joventut’s way to victory. Mallet added 14 points for the winners. Kuric paced Granca with 19 points and Eulis Baez added 11. Quarterfinals day at the Italian Cup Final Eight ended with a bang on MarShon Brooks’s game-winning jumper to list EA7 Emporio Armani Milan over Sidigas Avellino 60-68. EA7 Milan is joined by Grissin Bon Reggio Emilia, Dinamo Banco di Sardegna Sassari and Enel Brindisi in the semis. Samardo Samuels tallied 19 points and 12 rebounds and Linas Kleiza added 10 points as EA7 Milan pulled out the win in a game that was close throughout. Avellino started 0-7 and led 13-18 after 10 minutes, but Milan took charge in the second quarter and built a 32-29 halftime lead. Little separated the sides after that. Adam Hanga helped Avellino to a 43-49 edge early in the fourth quarter, but Samuels soon tied it. The final five minutes features five lead changes and six ties, the last of which was 58-58 on a Samuels basket before Brooks’s game-winner. Justin Harper led Avellino with 19 points and Hanga added 15. Grissin Bon Reggio Emilia edged Dolomiti Energia Trento 80-77 as Andrea Cinciarini starred with 16 points and 9 assists and Drake Diener added 14 points. Reggio Emilia led 45-35 at halftime, but Trento rallied in the third quarter and tied it at 61-61 early in the fourth. Reggio Emilia quickly regained the lead and though Trento stayed close, it never got closer than 3 again. Josh Owens tallied 19 points and 8 rebounds for Trento. The Italian Cup quarterfinals started with victories for Dinamo Banco di Sardegna Sassari and Enel Brindisi. Sassari bested Vanoli Cremona 74-63 as Edgar Sosa tallied 14 and dished 4 and Jerome Dyson scored 12. Sassari built on a 3-point halftime lead and led by 16 late in the third quarter. JazzMarr Ferguson brought Cremona within 55-49 early in the fourth quarter, but Sassari went on a 15-2 run to close out the game. Jeff Brooks added 11 points and 7 rebounds for the winners. Cameron Clark led Cremona with 16 points. Enel Brindisi was the day’s first winner after it beat Umana Venezia 70-80 behind 27 points on 6-of-8 three-point shooting from Jacob Pullen. Quarterfinals day at the French Cup in Disneyland Paris had no shortage of drama. In the end, SLUC Nancy, Le Mans, Strasbourg and JDA Dijon advanced to the semifinals. Le Mans edged JSF Nanterre 96-98 in a triple-overtime thriller. Michal Ignerski and Daniel Ewing scored 18 points apiece and Charles Kahudi added 15 for the winners. Jamal Shuler led Nanterre with 25 points and Mykal Riley scored 22 in defeat. LeMans dominated the second quarter to take a 27-47 halftime lead, but Nanterre worked its way back with a 13-0 run that bridged the third and fourth quarters to take a 58-57 lead on a Shuler three-pointers. There would be four more lead changes and four more ties before Ignerski tied it at 68-68 at the end of regulation. Mouphtaou Yarou of Le Mans split free throws in the final second of the first overtime to tie it again at 77-77. Roddy Beaubois scored 9 points in the second overtime session to keep Le Mans even with Nanterre, 87-87. Ewing made 3 free throws in the final minute of overtime No. 3 to put Le Mans ahead and Riley missed on Nanterre’s final possession. Nancy took out Limoges CSP 68-77 as Vaughn Duggins scored 25 points and Keydren Clark added 21. Nancy took charge early and led 28-42 at halftime. Nobel Boungou-Colo’s slam capped a 9-0 Limoges start to the second half, but Nancy did not let Limoges any closer and regained a double-digit lead by the end of the quarter. Nancy never got closer than 7 the rest of the way. Boungou-Colo led Limoges with 12 points and JP Batista scored 10 in defeat. Strasbourg outscored Le Havre in each of the four quarters en route to a 73-57 victory. The big men made the difference as Ali Traore scored 15 and Matt Howard posted 14 points and 10 rebounds; Strasbourg outrebounded Le Havre 36-25. Ricardo Greeg led Le Havre with 18 points. Steven Gray scored 24 points to lead JDA Dijon to an 80-66 victory over Paris-Levallois. The game was close for three quarters and entered the fourth tied at 58-58. However Dijon went on an 18-1 tear to claim the victory. Erving Walker added 18 points and 7 assists for the winners. Blake Schilb scored 18 and Sharrod Ford and Landing Sane netted 14 apiece for Paris. Zlatorog Lasko, Krka Novo Mesto advanced to the Slovenian Cup final with tough wins on Friday. Zlatorog Lasko defeated Union Olimpija Ljubljana 63-72 after a big second half. Olimpija took charge early with the first 5 and last 5 points of the first quarter for a 17-10 advantage. Consecutive threes by Klemen Prepelic, Halil Kanacevic and Dino Muric helped Olimpija to a promising 28-10 lead, which stood at 40-27 at halftime. Lasko came out for the second half hungry and rallied to within 42-39 on a Goran Jurak triple. Bojan Jovanovic free throws put Lasko ahead 47-48. Laso edged ahead 50-54 through three quarters before opening the fourth on a 2-12 tear to take control for good. Sasa Zagorac led the way with 20 points and Miha Lapornik added 13 points. Muric tallied 16 points and 9 rebounds and Kanacevic scored 13 for Olimpija. Krka Novo Mesto held off Tajfun Sentjur 65-66 in the first semifinal. Krka led 35-36 at halftime and pulled away in the third quarter to lead by as many as 14. Tajfun stormed back with an 11-0 run capped by Ceola Clark’s three-point play to take a 65-63 lead in the final minute. Malcolm Armstead hit back with a go-ahead three with 15 seconds remaining and Clark missed on the game’s final possession. Luka Lapornik and Chris Booker each scored 13 points to lead Krka. Clark paced Tajfun with 13 points, too. Crvena Zvezda Telekom Belgrade and Mega Leks booked the final two spots in the Radivoj Korac Cup semifinals with wins on Friday. They join Partizan NIS Belgrade and Vrsac Swisslion, which won on Thursday. Crvena Zvezda cruised past Konstantin 81-65 in a game that wasn’s as close as the final score would indicate. Zvezda led 32-16 after 10 minutes and pumped its advantage into the 30s before letting up late. Boban Marjanovic scored 15 and Marcus Williams 9 as every Zvezda player scored. Goran Ostojic led Konstantin with 12 points. Mega Leks topped FMP 92-85 in the early game. Marko Keselj rocked with 28 points, Nenad Miljenovic tallied 13 points and 13 assists and Dejan Musli and Nikola Jokic each posted double doubles for the winners, who finished the game on a 7-0 run. Strahinja Micovic scored 21 and Ognjen Dobric added 20 for FMP.